After 24 months of design, refinement, testing and more revisions the Moth Trap Pupae evolves into an adult. The ACPPT - Able Catch Pantry Pest Trap makes it's debut. At first glance the Able Catch Pantry Moth Trap looks a bit different. The Green stone pattern fits in today's homes. The trap shape is not a triangle, but a trapezoid. The foot print is also 50% smaller than most Moth Traps, while having a trap area 15% larger. But a closer inspection reveals an advantage hidden in plain sight. The instead of a solid tab, the tab is shaped into two arches. The arches can be bent away from the tab to form wings... Both short wings and extended long wings that can be used to place the trap in an abundance of locations that the old generation traps just won't go. By using these 'tab wings" the Able Catch has 3 additional placement options: Tuck , Hook and Loop... Essentially offering a zero-footprint moth trap. More on those in another post. Able Catch Trap design takes into consideration how the world works today. By that we mean e-commerce is no longer e-commerce, it's really just commerce... Most customers will buy the Able Catch Traps from online vendors, and with that in mind, the ACPPT does not contain any exterior packaging and the instructions are printed on the inside of the trap. 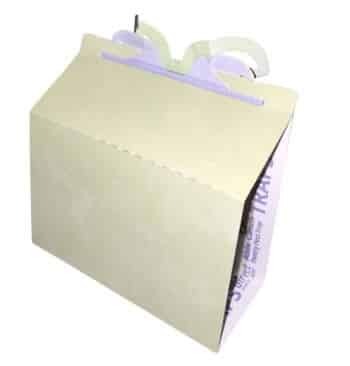 Exterior Boxes or Plastic Cello wrappers are designed for a retail setting. The colors to attract attention on a shelf, a box to convey 'size' and have instructions printed on them. But in today's world, these aren't needed, and negatively impact the carbon footprint of most old school moth traps. In fact some national brand moth traps come in a 4 color cardboard box that is the same amount of cardboard as the BOTH traps combined.. 100% wasted cardboard, ink and because it is 3 dimensional, the carbon foot print of Able Catch Traps is 1/9th the cost of a national brand boxed and assembled traps. Able Catch can ship 90 traps in the space that national brands ship 10 traps. This entry was posted in Ask Traps Direct, Moth Trap Blog, Moth Trap Reviews and tagged Able Catch, Able Catch Pantry Pest Trap, Fresh Pheromone Lures, Moth Lifecycle, moth pheromone trap, zero-footprint moth trap.